Stephen Mueller grew up in Saint Louis and was torn between studying organic chemistry and pre-med or architecture. “The more I learned about what architects do, that they’re invested in a whole range of disciplines, it seemed a rich career to embark on, because it combines an artistic side and a scientific side,” he says. Kripa and Mueller met in graduate school at Columbia University. Kripa had fled Albania after the fall of communism, immigrating to Greece before attaining refugee status in the U.S., where she got her undergraduate degree at NJIT. Mueller got his B.Arch at The University of Kansas and moved to New York City to work for NBBJ. In their final semester at Columbia, they applied for a travel fellowship, won it, and embarked on a research trip to Albania and Greece. The experience bonded them as a couple and cemented their collaboration, which eventually became AGENCY. Back in the U.S., the couple worked for firms in New York until the financial crisis hit. After some soul-searching, they quit their jobs and applied for — and won — a MacDowell Colony fellowship, which gave them two months’ room and board in the woods, where they worked on the first iteration of their new book, “Fronts: Security and the Developing World.” The research they conducted, which involved cataloging successful urban tactics in developing world communities, won them the Rome Prize and the ONE PRIZE, set off a series of international exhibitions of their work, and landed them teaching positions at Washington University. 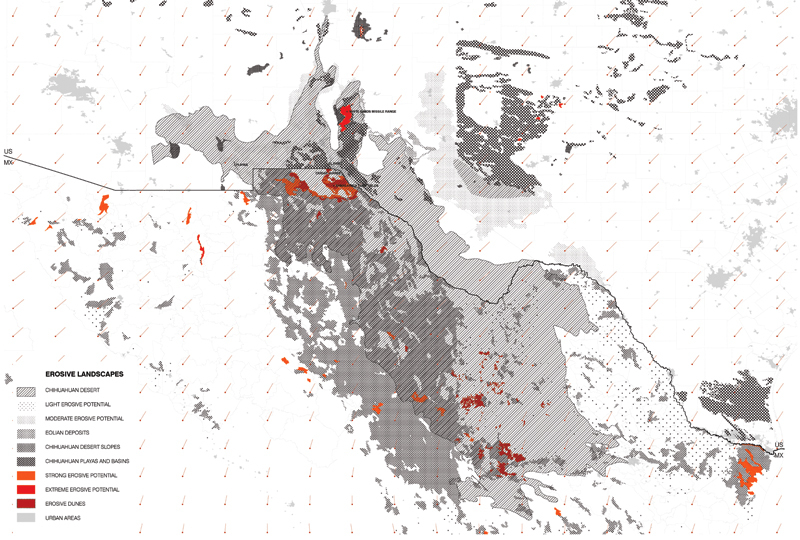 Much of AGENCY’s research focuses on border communities and informal environments, and on how these localities are changing under the pressures of rapid urbanization, ecological instability, and resource depletion. This interest brought them to El Paso, where Texas Tech was growing its architecture school. They applied for a teaching position there and got it in 2015. This project seeks to coerce selfie-taking behavior in public space in order to create a forum for highlighting the dangers of online sharing. 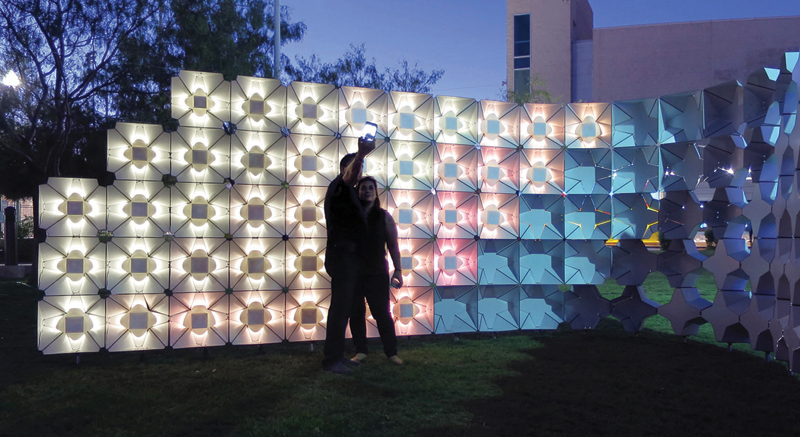 It creates a range of lighting conditions day and night, offering a dynamic and interactive space for self-photography. 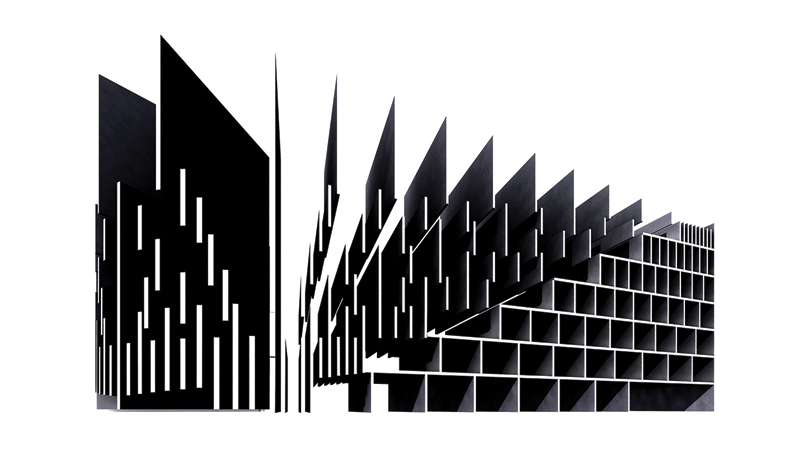 The wall is built from 162 custom-fabricated units, CNC-milled from composite aluminum panels and folded to shape different apertures for bouncing, scattering, and collecting light. The shape of the modules transforms from a structural cross-shape to a more open “umbrella,” providing consistent structural rigidity throughout the wall surface while providing a range of lighting options. These mass-customized variations evoke lighting solutions across a variety of industries, simultaneously signaling “barn doors” on stage lighting, photo umbrellas used in portrait photography and film, and vanity fixtures. Dust Sensors is a low-cost, open-access, and cross-jurisdictional distributed air quality monitoring sensing system. Currently in the prototyping phase, it uses a low-cost Grove Dust Sensor, which incorporates a photo diode to measure the relative opacity of environmental air passing through the sensor housing. The sensors will provide real-time airborne particulate measurements and Air Quality Index calculations to a website that will turn the data into a geospatial visualization, allowing people in monitored communities to gauge particulate flow and possible impact in real time. Preliminary plans involve installing the sensors in two low-income communities on opposite sides of the U.S.-Mexico border fence: Anapra, Chihuahua, and Sunland Park, New Mexico. The “21-foot rule” refers to the distance law enforcement maintains between its members and potential assailants — that interval being thought sufficient to give the average officer time to draw their weapon and neutralize the average attacker. However, there are many variables that affect the amount of “safe zone” space necessary, such as fitness, traction, rain, and lighting conditions. This project proposes a spatial training matrix to develop improved de-escalation tactics. It sets forth a 21-ft structural grid that expands and contracts, with a floor that tilts, to simulate encounters both comfortable and claustrophobic. By shifting the conditions of the encounter, the architects offer space to reimagine the distance between life and death.